Recommended to view by Mak, he insists that I must watch this! I found a show better than "SAW" or "HOSTEL" in terms of violence and gore! Yes! There will be BLOOD! Lots of BLOOD! and plenty of.... cheese! See how this otaku-favourite Japanese High School girl icon equip herself with a GATLING GUN! She will also treat you to a good TEMPURA! WARNING! Not for the faint-hearted! We have all had "Mee Goreng" (literally translated to 'noodles fried'), but for a probably 30c worth packet of instant noodles that is 'goreng'-ed and served at 10x the price? That is "'MAGGI' Mee Goreng". The local Indian Muslim food operators take a packet of 'MAGGI' instant noodles (Curry Flavour) and fry it like with egg, cabbage, leavey vegetable, chicken chunks and most importantly the sachet of curry soup base that came with the instant noodle. You can find "'MAGGI' Mee Goreng" at almost any Indian Muslim coffee house, I had mine at Ang Mo Kio Avenue 10, Haji Karim's. I have tried this dish at a few other places as well. They all tasted great! Some say that it is the magic of the MSG and I totally agree. Its addictive! I would definitely nod to paying S$3 for this and even S$4 for a 'double-MAGGI' (which means frying two packs of the 'MAGGI' instant noodle). Just make sure, do not attempt to ask for two packets of 'MAGGI', 'cos you might just end up with two packs of takeaways! If you have not tried "'MAGGI' Mee Goreng", time to take a break from the "Mee Goreng biasa" and try it today! (shouted) Who sir, you sir? No one in the chair, come on! Come on! Sweeney's waiting. I want you bleeders. I was extremely lucky to be invited to view a special preview before the show actually opens tomorrow (Thursday 31st, 2008) in Singapore. A truely remarkable piece of theatre made into a dark motion picture masterpiece by Mr. Tim Burton. Johnny Depp has once again impressed audiences and fans with his excellent acting finesse as well as singing in theatre! In the movie, you will also see performances by Alan Rickman who played "Professor Snape" in "Harry Potter" series, as "Judge Turpin"; as well as Timothy Spall who played "Scabbers/Peter Pettigrew" in "Harry Potter" series, as "Beadle Bamford". If you like "Phantom of the Opera" (Movie version), you will love "Sweeney Todd". 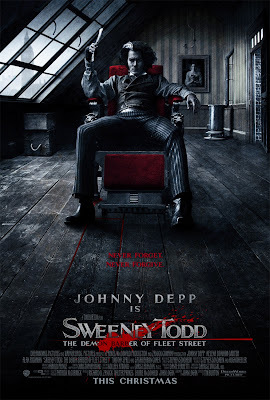 If you love Johnny Depp, then you must not miss "Sweeney Todd"! From the stall that I had the fabulous "Chong Pang Curry Chicken Noodle" at 453A Chong Boon Market & Cooked Food Centre, I had "Mee Rebus". "Chong Pang Curry Chicken Noodle" stall serves only these two dishes, and I have tried both! "Mee rebus" ('noodles boiled') is a Malay-inspired noodle dish largely popular in the Southeastern Asia, such as Singapore, Indonesia and Malaysia, also a highly adored a loval favourite. Yellow egg noodles are also used and goes with a spicy slightly sweet savoury gravy, made from potatoes, curry powder, salted soya beans, dried shelled hrimps, and peanuts. I also comes with boiled egg, calamansi (lime), Chinese celery, green chillies, tau kwa (dried beancurd), bean sprouts and fried shallots. 'Q' egg noodles drowned in a very heavy "mee rebus" gravy topped with the usual garnishings, one boiled egg halved, calamansi (lime) to add a tangy punch to the gravy, Chinese celery, potato half, chopped green chillies, small tau kwa cubes, bean sprouts and fried shallots. The gravy is very thick and heavy, thus causing the noodles to clump. Nevertheless, the gravy is sedap (fabulous taste)! Some dislike the taste of the thick yellow egg noodles, but the gravy has masked much of its taste. To add more excitement to the taste, chilli paste and lime can be added. I particularly love the biting texture attributed to the small fried shallots and dried shelled shrimps. This"mee rebus" is cooked by the Chinese and not the Malay, which is not a rare sight in Singapore, where cultures criss-crossed in harmony. Good stuff! With your mouth still filled with the after-taste of the lovely gravy, you will never go home disppointed especially when it costs only S$2.50! Since their price increment, I visited less of "Han's". Nevertheless, every now and then, I would still visit them for their set meals. I always like their "black pepper chicken chop" (S$9.90), but their "roast chicken" is not bad as well. Every set meal at "Han's" comes with a soup of the day usually "mushroom soup", garlic bread, main entree, dessert and beverage (coffee, tea, iced lemon tea or orange juice). A huge tender juicy white meat with roasted cripsy skin marinated with mixed herbs, served with baby carrots, hashbrown and black pepper sauce. For the second time at "Han's" at Trinity@ Paya Lebar, for the variables, I had mushroom soup and peach half in heavy syrup. Despite the price increment, their quality of food did not change at all. All the good and wholesome food prepared in a holy place makes it even special. Nevertheless, the set meals at "Han's" are still considered affordable without any surcharges. The "Roast Chicken" I had was fantastic. I could hear the skin crackle as I pryed open the skin. There was not much fat but lovely juicy tender white meat! Look at how the meat is 'sweating', the juiciness of the meat glistens. The baby carrots were sweet and seem a tad unnatural, but still was nice. You do not have to necessary visit "Han's" at Trinity, but this place does have a good ambience overlooking...... Paya Lebar Road and the warehouses (eg. where I scored my sneaker that was fit for the brave). I knew I had to score this during the "CONVERSE" warehouse sale! Apparantly this shoe was originally made available to the Japan market only. Nevertheles, it found its way to Singapore. Only the daring ones will put these on! I am, I did, I will! The CONVERSE WEAPON series is an incredibly comfortable shoe with a thick sole, leather body with thick cushions. I thought I was wearing an Air Force 1! Someone asked me what is a "REVOLTECH"? OMG! This is a "REVOLTECH"! The EVA-01 TYPE F is not really my cup of tea. It is just not a sleek as EVA-01 and here. 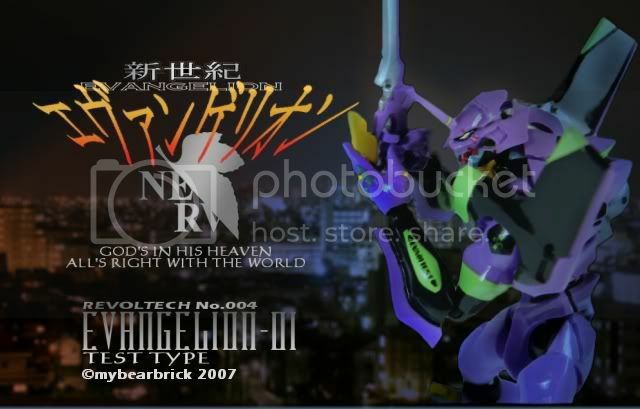 But as a REVOLTECH collector, I strive to complete my collection, particularly my EVANGELION series. REVOLTECH No.028 EVA-01 TYPE F AFC Experiment is not as poseable as its predecessor, due to the bulkyness of the frame. KAIYODO manufactured this figure using a completely unique material which has subtle tones of fluorescent colours and a smooth-matt finish. Oddly, the head is glossy! Sadly, this material/finish has not been re-used since this figure. The finish makes this figure very photo-taking friendly, as there are no nasty overexposed patches from the glossy-finish. This figure is a REVOLTECH G2 figure and stands 1cm taller than the older REVOLTECHs. I apologize for the error in the banner, it should be "AFC" and not "ARC". Head with open jaw, pair of daggers, shoulder blaster beams, 6 spare hands and stand (not shown). CATS: "7.5 on Richter Scale"